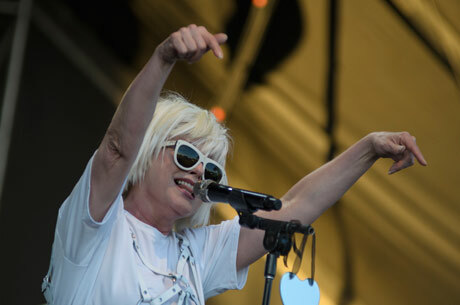 Although Blondie's 40th anniversary tour may carry an air of nostalgia, (the tour coincides with the release of yet another greatest hits collection), the New York new wavers have been steadily touring and releasing albums since they celebrated their 30th year together. In support of their tenth LP, Ghosts of Download, Blondie drew a small but jovial crowd out to Bluesfest co-headlining stage. Made up of founding members Clem Burke on drums, Chris Stein on guitar and the magnetic Debbie Harry on vocals, the six-piece live version of Blondie entered the stage seeming a bit ragged and tour-weary. A week after celebrating her 69th birthday, Harry's voice nonetheless held up nicely as she waved lovingly to the crowd while cooing her way through hits like "One Way or Another," "Hanging on the Telephone," "Call Me" and "Atomic." Anchored by the youthful guitar playing of Tommy Kessler, the rest of Blondie mostly remained static through an hour-plus set that featured a number of new tracks alongside a few surprises like their 1999 hit "Maria," the underrated "What I Heard" from 2011's Panic of Girls and a rendition of "Rapture" that included elements of Beastie Boys' "(You Gotta) Fight for Your Right (To Party)." Closing with "Heart of Glass" and "Dreaming," Blondie gave the crowd just what they wanted; the hits, no frills.